Shangdong Provincial Agriculture bank was established in 1951 and after 60 years of development it now has 31 branch banks, 5564 outlets and 64000 employees in Shandong Province. With 150 billion USD capital, it has become one of the biggest regional banks in China. The offsite backup data centre building has six floors; one floor underground and five floors above ground, with a total of 4,115 square metres of construction area. The disaster recovery centre and data offsite storage centre located on the first and second floors are connected to two different telecom operators by 10,000 metres of OM3 fibre cable to ensure the network connection is ready to operate 24/7. 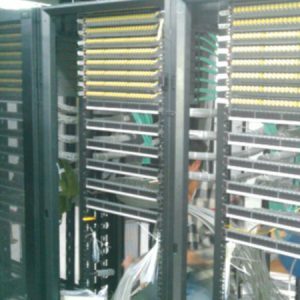 88 storage, equipment and server racks are connected by 335 PowerCat 6 24 port copper patch panels, 200 24 port fibre patch panels and 5,000 fibre patch cords, all working together to ensure the total reliability of the infrastructure responsible for the important backup of the banks data. In an emergency situation, the backup centre could also take over the responsibility of running the whole bank system – just one more reason why a reliable infrastructure solution was essential.